A 30 foot Trojan Yacht is your chartered watercraft for fishing and/or cruising. Lots of space with covered shelter to get out of the weather, a head and table space that seats four are some of the amenities. All the latest fishing equipment is provided. 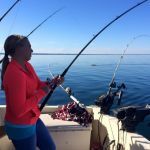 Your charter experience includes hands-on help with setting up the lines, picking your bait and bating the hooks. From there on, all that's necessary is patience because the fish may take awhile to bite. 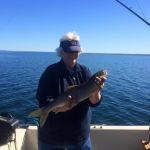 By far, the most fun fishing Lake Superior is when the fish are on the surface and eager to feed. While fishing you don't know which species have been hooked. 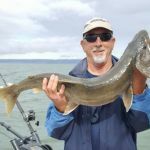 The fish species are Lake Trout, Walleye, Coho, Chinook, and King Salmon. 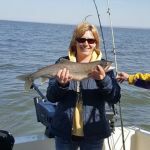 All you need to bring is warm clothing, rubber or soft sole shoes, MN DNR angling license with a Great Lake Trout Stamp, sun and wind protection along with your food and beverages. Beer is ok, if well tolerated on choppy waters. You don't want to get sick. Final reminder, don't forget a cooler to haul your fish in. Minnesota residents over the age of 65 don't require a Great Lakes Trout Stamp. Kids under 16 don't require a license or stamp. This is a great time to take your father or brothers or sister out fishing. We can take up to six (6) people on board for fishing or sight seeing. Veterans will get a discount on the fishing trip and Disabled American Veterans with a Chapter local in Minnesota will get an additional discount. Proof of being a disabled veterans is a DD-214 or a VAMC Card. A DAV Member must have a chapter card for the discount. No other proof is required. Scott Berndt was raised in Superior, Wisconsin. 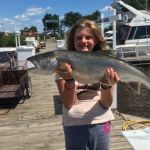 At the age of 11 he started his Lake Superior Fishing with is Father. Fishing most of the weekend when weather permitted. This continues on till age 18 when he joined the Military for a 23 year career. After retiring from the U. S. Army he started back fishing Lake Superior. When it comes to knowledge on fishing Lake Superior he has many years and different type of fishing techniques. For the past ten years he has fish the lake continually during the spring, summer and fall. Finding fish and catching them get better every year. Scott joins the Disabled American Veteran in fall of 1997. And has been a member ever since. Last year he heard about Chapter Boat captain taking veterans out on Lake Superior from the Silver Bay Veterans Homes. He knew he had to get involved in this matter so he set out to get his Captain License from the Coast Guard. 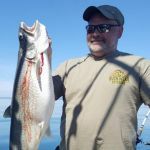 In April 2010 he was granted is Captain License and want to has already sign up to help with the Silver Bay Fishing Day on Lake Superior. Since he has a Captain License and a 30 foot Trojan Yacht Boat. Why can't I take other people out to enjoy what I enjoy and that fishing Lake Superior. The Trojan Boat is fully equipped with eating area, bathroom and lots of seating room. You can go down in the cabin to get out of the sun or weather and ride. I am just starting out as a Captain, but I feel I can fish with the best of them. I am going to try to build a customer base and friends that love to fish and take the challenge on fishing the Great Lake. $75 deposit is required to hold date. Wisconsin 5.5% Tax not included in price. Veterans get special price for booking. Special rate for 2 people offer. Short notices are welcome, need 4 hours notice for travel time. Cancellation Policy Charters can be cancelled due to severe weather or gale warnings on Lake Superior. Rain will not stop the charter, but lightning will. If the charter is cancelled you may choose two other dates that are open. Refund will be given if written notice is received 10 days prior to fishing date.